For years, I was always a bit sad that we very rarely got to have Christmas in our own home, but instead Christmas Eve found us traveling several hours to spend Christmas with extended family. It was fun sharing Christmas with extended family, but we missed waking up Christmas morning in our own beds, with presents under our own tree, and building memories of our home. However, as is normal for our family, we created quirky traditions that became an integral part of this annual trip 'over the river and through the woods' like making sure we listened on the card radio to Hispanic Christmas Carols as we drove to the Chicago suburbs. Christmas Eve just wasn't complete until I heard 'Mamacita, Donde Esta Santa Claus?' We also made sure we attended the Christmas Eve candle light service at our church before making the trip; no matter how hectic the last minute preparations were, with all the gifts and suitcases packed into the car for the trip, when we were walking into church, the true peace of the Christmas season would wash over me. That annual reminder of our true Christmas celebration always put everything else into perspective. This year, just like many other things in our life, Christmas was again going to be different. Alan and I were on our own and we could do whatever we wanted - even stay home this year for Christmas! So what did we decide to do for Christmas... head to Branson, Missouri. 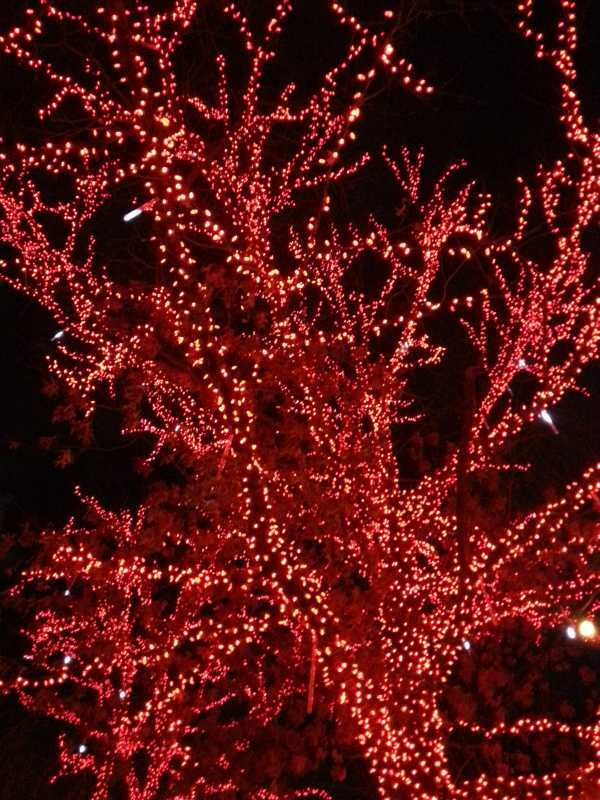 This plan started to hatch when we discovered that Branson is famous for it's Christmas lights. After a bit of Googling, we realized a trip to Branson may be a fun Christmas adventure. So, just like all those 'Christmas Pasts' we packed up to drive over the river and through the woods for Christmas. Instead of a Christmas Eve departure, we left on Sunday, the day before Christmas Eve. We planned our schedule based on various activities we wanted our agenda to cover. The traditional Hispanic Christmas Carols were replaced with Bluegrass renditions as we drove through the Ozark Mountains. As we neared Branson, there was a section of highway where someone had stopped along the roadside and randomly decorated scraggly cedar trees with colorful, shiny Christmas ornaments. It was one of those things that would be a part of the magic of Christmas for children riding by on their way to grandma's house. 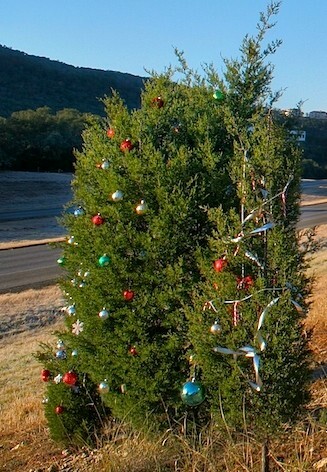 Had we known about them, Alan and I would have brought some of our solar Christmas lights so that these rag-a-muffin trees would light up as well! Washboard Leo - a member of the Cajun band. We arrived in Branson, and the first stop on our agenda was Silver Dollar City. I had some trepidation about going to an amusement park in December, and I had my doubts that the Christmas decorations would live up to their description. I was expecting a half-staffed amusement park that was making a feeble attempt to cash in on Christmas, and I will be the the first to admit I was wrong. The first surprise was how busy the park was. It was a beautiful, warm day and many people came out to ride the rides and see the special holiday shows and light displays. We enjoyed two musicals - Dicken's Christmas Carol, which had amazing set changes, and It's a Wonderful Life which was a new production this year. 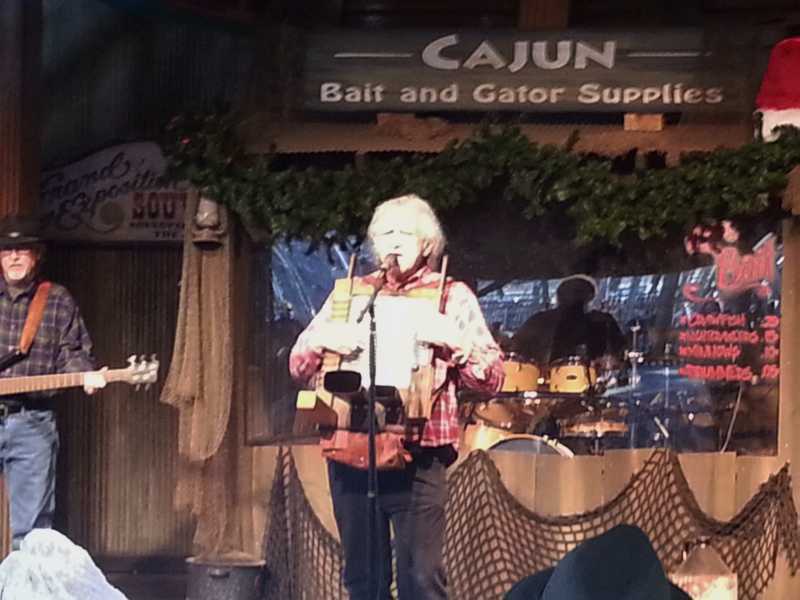 We also enjoyed the Cajun Christmas music show. There were so many shows scheduled, we had to plan out the day beforehand to make sure we could fit everything in. It was also wonderful just walking around enjoying all the effort that was put into transforming this park into a Christmas Wonderland. After the Parade of Lights that wound through the park, we had one more show on our agenda, which was called 'Homestead Pickers'. When we reached the venue, we discovered it was in a small log cabin. All the other shows had been in large, packed theaters, so I thought the cabin was just the entrance that would open up to an outdoor amphitheater, but I was wrong. We stepped into the cabin and found it was filled with an assortment of wooden chairs and had an old fashioned bedstead in the corner. This venue would only hold about 35 people. We took our seats and were at first disappointed because there was elderly rather 'rough' lady in the audience that was talking local politics (rather loudly) and then when the first musician of the bluegrass band arrived, he continued the discussion with her. 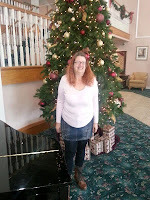 Then, as they got started we discovered this lady was not only a long time resident of Branson but also volunteered each year to tell a delightful mountain-folk rendition of the The Night Before Christmas each year at this venue. The schedule said the bluegrass music was only a 25 minute show followed by a telling of a Christmas story, and that this story only occurred after the last show of the evening, so we were glad we had put this last on our agenda. 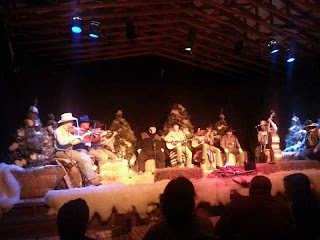 After Jessie had finished her story, which again included the true meaning of Christmas as was intertwined throughout the Silver Dollar City experience, the bluegrass band began to play some requests. Children in the audience had their requests ready with songs I had never heard of. 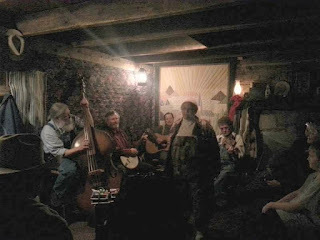 They turned out to be some silly songs about chickens and turkeys and it became apparent that this was a traditional stop for many of the people in this little log cabin. As we were enjoying the music, there is a knock on the back door of the cabin, next to where the band is playing. A musician opens the door and in walks 'Uncle Jake' in his red flannel Union Suit, who announced he was the owner of the cabin.and was coming in to go to bed. Since his house was full, including a few people sitting on his bed, he sat down with the band to talk for a while. What followed was a very hilarious half-hour with a lot of improvisation that even had the band members cracking up. The audience even started chiming in with 'one-liners'. The 25 minute show went on for over an hour and as we were leaving that cabin, Alan remarked on the fact that while we had thoroughly enjoined our entire experience at Silver Dollar City, that last hour spent in a tiny, packed, over-heated log cabin was by far the highlight of the day. We started out the morning with a bit of relaxed window shopping that included picking up a couple more Ozark related ornaments to add to our tree next year. 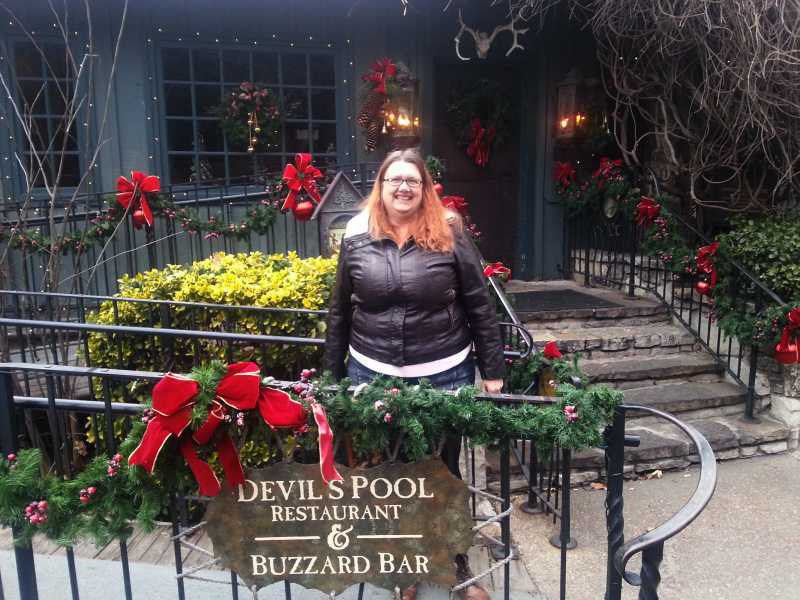 When planning our trip, Alan researched online for a place that we could go to for Christmas Day brunch. The place he found also had listed on their web site that they were having a non-denominational Christmas Eve service at their conference center, followed by caroling and a tree lighting ceremony, so we decided that was the Christmas Eve service we would attend this year. 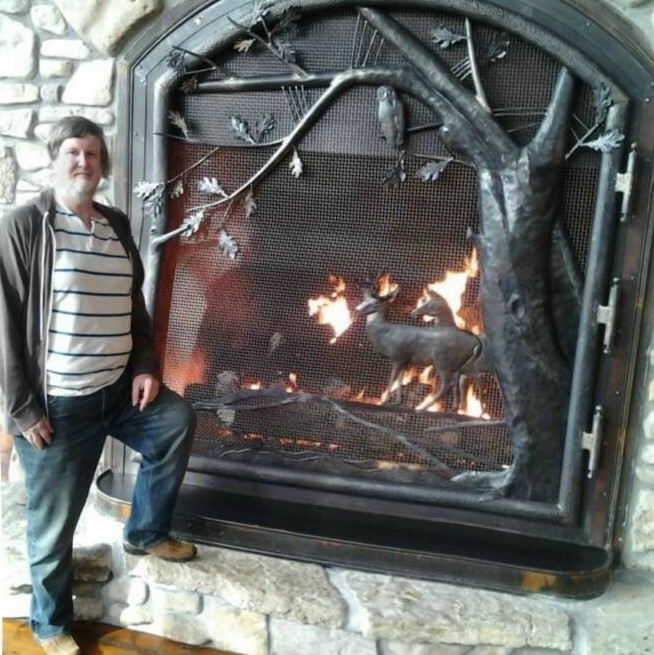 This resort was called Big Cedar Lodge, and it was amazing. As we drove through the entrance and down the twisting, turning drive, there were several signs directing RVs, buses and motorcycles to take an alternate route. We were stumped about the motorcycle ban on the road, and assumed it was due to the sharp twists and turns. However, as we neared the actual resort, we discovered vehicles had to drive 'dead slow' as they drove through two areas where springs flowed over the road. It is not that the place was run down and the springs had overflowed the road, this was actually a very high-end resort and the road was created with cobblestone sections to actually allow the springs to run unimpeded down through the landscape, including over the roads. We approach the spring flowing over the road ----and make the crossing. A view of another crossing..
we needed this fireplace at home. The conference center was designed like a huge hunting lodge and beautifully decorated. 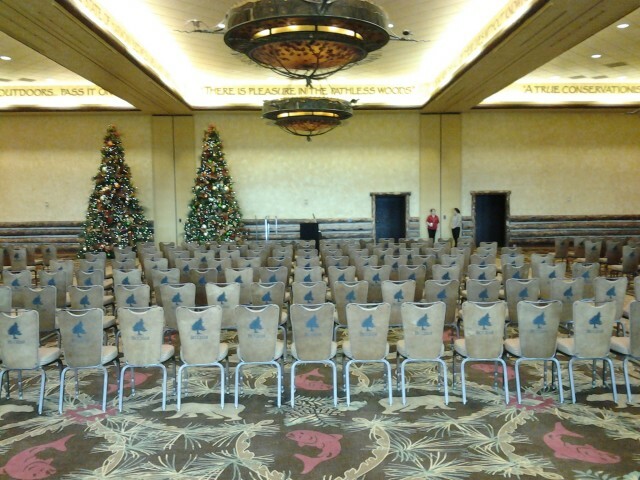 We found the conference room that was designated for the Christmas Eve service and there were several hundred chairs set up. I had been expecting a small room with just a few people attending and a somewhat vapid rendition of a Christmas Eve service. Instead, a local evangelical pastor performs this service every year and it is attended by hundreds of people. There had been a mis-communication on the service time, so the choir was arriving a bit late. The pastor filled the time by telling a story of when they had almost had to cancel the service about 20 years ago due to a huge snow storm, but the lodge had brought them out to the service in 4-wheel drive trucks. Some of the people attending this year remembered that year and families have been coming to this service for many years as their traditional Christmas. The room where the Christmas Eve service was held. Besides the lovely service that was again Christ-centered with an evangelical message, there were very cute decorated sugar cookies and real hot cocoa (not that packaged stuff) which also added a little to the Christmas magic. Following the service, we drove to another part of the resort for the tree lighting ceremony. It was fun to see how excited the children were at this event, The lodge put in lot of effort with crafts for the children, more hot chocolate and treats, bonfires and out-door heaters and carriage rides. 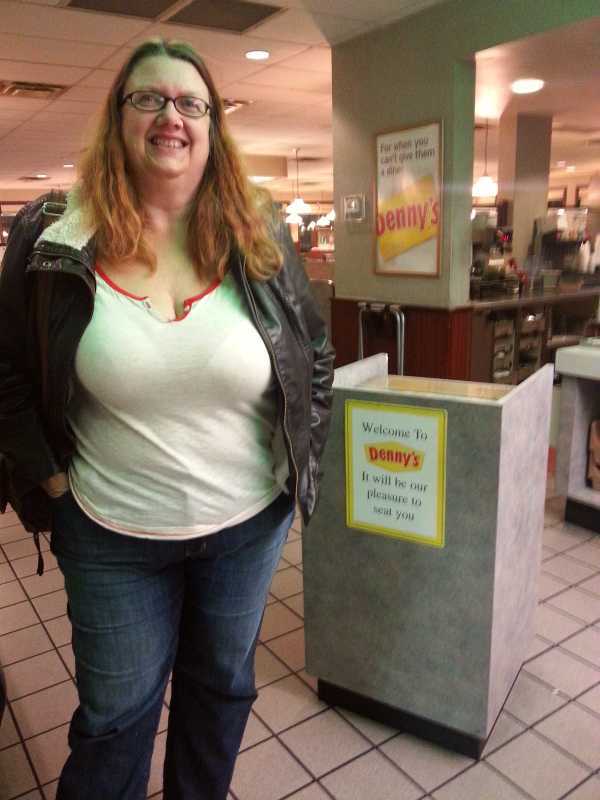 When we left the lodge to return to Branson, we decided to have dinner at someplace we said we always wanted go - Denny's. back in the 90's a Contemporary Christian Rock Singer came out with a song called 'Christmas at Denny's', a rather depressing little ditty, but a great way to build another memory! Then back to the hotel to enjoy Christmas Eve in the hot tub. 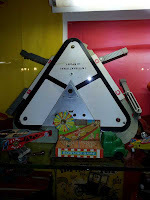 After the fabric store, next on our agenda was a Toy Museum, where Alan had lots of fun showing me all the various toys on display that he had had as a child. The Toy Museum was also home of the Harold Bell Wright Museum. Harold Bell Wright is best known as the author of 'Shepherd of the Hills' although he also penned 17 other books. Shepherd of the Hills was turned into a play many years ago and it became the first attraction to ever reside in Branson, and it is now the longest running attraction as it is still performed in the outdoor theater. 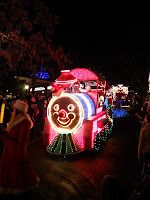 This is a good segue into our main activity today, the play is not performed in the winter, but the Shepherd of the Hills grounds are transformed into the Trail of Lights - a 2 1/2 mile drive through an animated light display. The Sons of the Pioneers chuck wagon dinner show, which precedes the play during the rest of the year, is transformed into a country and bluegrass Christmas show during the holidays. 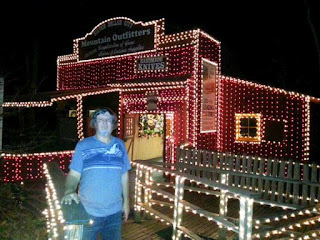 We spent an enjoyable evening of dinner and the Christmas themed cowboy show followed by a drive through the lights and then a trip up into Inspiration Tower, a 230 foot observation tower, to view Branson at night. A highlight of the evening is that the owners of Shepherd of the Hills were sitting right in front of us at the show and we were able to meet them. And so ends our first Ozark Christmas, tomorrow we pack up and head back to the property. For all of you that were disappointed that this blog entry did not involve our off-grid experiences, fear not - when we get back home we have to jump into a lot of projects because we have company coming in January and we have a lot of things to get done before they arrive. In my last post, you learned that for many years Thanksgiving is the holiday that we put all of our effort and enthusiasm into. 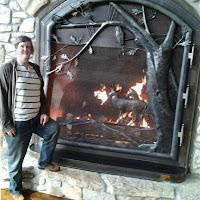 However, with this being our first off-grid Christmas, and being down in the Ozark Mountains, Alan and I decided it deserved some effort as well. OK, to be honest we were just excited to see what we could come up with. First, we wanted some outdoor lights so that all our neighbors could 'ooh' and 'aah' at our glorious display as they drove past our house. We found solar charged Christmas lights at Big Lots, one of our favorite shopping destinations. To the right is a picture of one of the chargers. Each box contained a 12 foot string of 50 LED C6 multi color lights, a charger and both a yard stake and a mounting clip for versatility. We chose to use the mounting clips to attach the solar charges to the deck rails. We purchased three boxes, so our outdoor display is an amazing 150 lights which stretch into a dazzling 36 feet of luminous beauty along our front deck. Next came the tree. I had heard on the radio that there was a person that came to a nearby city (an hour away) every year to sell Christmas trees and I told Alan we should go there to buy our tree. Why there you may ask.... because this person brought his trees down from Wisconsin each year to sell them here in the Ozarks. So off we drove in Truck to get our Wisconsin Christmas tree. We pull into the the parking lot of the mini-golf course, which is where this tree sale is set up each year, and by the looks of the trees on display, you would have thought we had arrived on Christmas Eve rather than two weeks before Christmas. The available choices consisted of four scraggly trees leaning up against each other in the middle of the lot and the workers were packing up their gear. They had sold out of trees already. So off we went to Lowe's to buy a tree from who-knows-where. While we were 'in town' I also stopped at Hobby Lobby to get some supplies for some special ornaments I wanted to make, more on these later. We get the tree home, and first come the lights. We had also previously purchased Christmas lights for the tree at Big Lots. 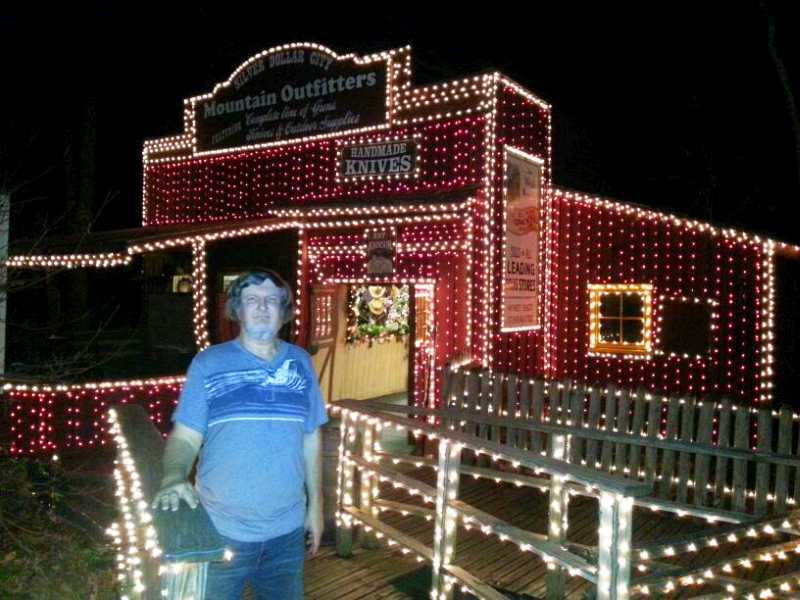 We had a box of 120 (two 60 light strands) of the small Italian style lights and a box of 60 larger lights that were the same conical shape as the lights in our wondrous outdoor light display. All of these sets were LED as well. Now these strings of lights were designed to be used in 'normal' houses with 'normal' outlets so we needed to plug them into one of our power inverters. Our wall outlets are 12V DC, the power inverter is plugged into the outlet and provides a 'normal' household voltage for the lights to plug into. Plug the first string into the power inverter and then add each string to the previous one just as usual. With the three strings illuminating our 7 foot Frasier Fir, we turned off everything else in the house (two ceiling lights at the time) and ran into the laundry room to see what the reading was on the charge controller. We wanted to know the amount of power our tree lights were pulling to determine how long we could bask in their beauty each day. I actually jumped for Christmas Joy when the load indicator displayed just 0.8 amps, which is less than running two of our overhead lamps. 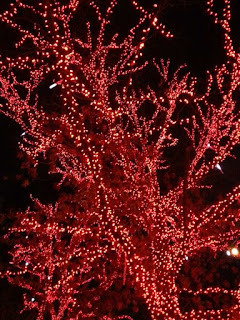 We can keep the tree lights on all evening - even all day if we do not have too many overcast days in a row. A second rows of batteries (top shelf) have been added. You may be familiar with the various television programs that are televised each Christmas season, the ones that show extreme Christmas light displays that people erect each year. Many of these shows include information on how home owners have had to re-do and expand the electrical feeds in their homes to be able to power these holiday monstrosities. Well, Alan must have had preconceived notions of our glorious display because the week prior to our Christmas decorating free-for-all he added four new batteries to our solar system which double our storage capacity.We now have just under 1,000 amp hours at 12 volts. "This is a test, for the next 21 day you will find yourself back on-grid. Your mission, should you accept, is to determine what you have missed most while pursuing your off-grid lifestyle..."
Thanksgiving has always been our family's favorite holiday. I think one of the reasons is because it culminates our favorite time of year - that 'dead time', as fall is winding down and winter is nearing. Another reason is that we have striven to make Thanksgiving the holiday that is very personal to our immediate family. While Christmas always required trips to extended family, Alan and I designated Thanksgiving as 'our holiday' for building family memories and traditions. And, as it is with the rest of our life, most of these traditions are not 'normal'. As our family has grown over the years, so have the quirky traditions. Many years we have rented a vacation home for our Thanksgiving celebration. When the kids were growing up, we could get by with a three bedroom rental - parent's room, our daughter's room, and our son's room. The longest standing tradition is a quirky little movie Alan insists we all watch after Thanksgiving dinner. Some of the artwork in this year's rental home. 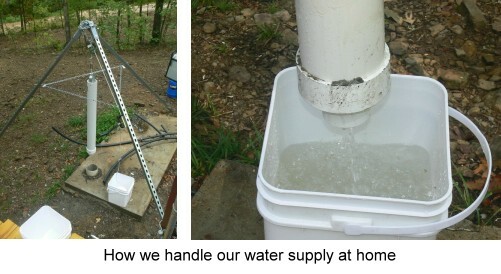 everything has to have a use in our off-grid house. 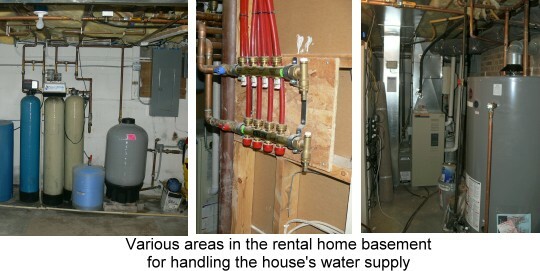 Then, several years ago, we had to start modifying our rental requirements. Our youngest daughter's boyfriend, would be joining us, so our rental needed four bedrooms that year. The new tradition we added that year was 'Cheese Races'. The following year they were married, but wait, our oldest daughter's boyfriend would be coming that year as well. With the need for 5 bedrooms, we could no longer rent at our usual place, so we searched and found a rental that used to be a Bed & Breakfast. I ran with the bed and breakfast theme and had 'welcome baskets' in each bedroom when the kids arrived. They enjoyed these so much (like Christmas stockings) that we decided to add another tradition, I provide the baskets and everyone adds little gifts to them anonymously as they arrive for the week, and yes, many of the gifts are very 'unusual'. The kitchen in that year's vacation home was amazing and we decided to add yet another tradition - a cooking contest. This was also the year our annual event was dubbed 'Turkey Palooza'. I won't go into detail on how Turkey Palooza has expanded over the past few years, but I wanted to give this background to explain why it is an integral part of our 'test' this year. Because, you see, as the size of our vacation homes increased each year, so did their amenities. Large homes with professional kitchens, opulent bathrooms and even running water and unlimited power! We have been off grid since mid August, our longest stint yet. And as we were preparing for the trip back up North, I found myself wondering if I would find myself realizing that there were many things that I was missing from the 'old life' once I was again immersed into the on-grid lifestyle.Would it be hard to give up the 'easy life' after three weeks and return to our off-grid chores? The very first thing I need to share about our Turkey Palooza trip is very sad. 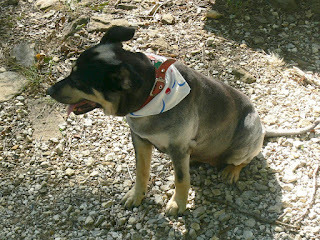 As you may recall, our dog Maycee came down to the property in August. We originally planned to board her down here when we went back up North, but as we would be gone for three weeks, we decided to take her back up with us and then board her at her favorite kennel for the actual Thanksgiving week. Maycee has loved being down at the property. Although 14 years old, she enjoyed helping with chores outside and exploring the property with us. Just a couple weeks before we left we had the survey of the property completed and she walked the property lines with us, running ahead and around us exploring amongst all the trees and rocks. We arrived up North a week before the start of Palooza and we stayed with very dear friends. The first day there, I must have used the equivalent of 10 bottles of water for just one shower. (At the property, I limit myself to one of our storage bottles per shower which is about 3 gallons.) That first week Alan and I had fun exclaiming over the many 'wonders' we found at our friends house - like the pipe on the wall in their bathroom that provided a supply of unlimited hot water and the magical box in their kitchen where you put dirty dishes in and an hour later they came back out clean. Our Palooza house was larger this year because my parents were coming out from Pennsylvania to join us, as well as our dear friends mentioned above. So, we were 'spoiled' with a lakefront vacation home for a week and then returned to our friends' lovely home for another week before returning to the reality of off-grid life. Our youngest daughter, along with her husband and son, and possibly our son, will all be coming down to the property in the next month or so and plan on staying for a month. With that in mind, Alan and I have been looking for a vehicle that would hold us all and be durable enough to take us to all the places we want to show them (like driving up and down our road to our driveway!) We decided a four door pick-up truck would be a good solution, one with a full size bench seat in the back. While up north, we found 'Hoss', pictured here. We can fit five people plus a car seat, and Hoss is a diesel, which was also on our list of criteria. We left Rodney, our Kia Sportage, up North for the time being so we did not have to drive two vehicles back home this time. Cache and KayKay resting up after exploring. (aka KayKay- our daughter named her Ceilidgh, which is pronounced kay-lee and is a type of Irish folk dancing). While the cats did not exactly enjoy the 12 hour trip riding in their cat carriers on Hoss's back seat, the 'kitty downers' we got from our vet made the trip much easier on us then it might have been. The medication was actually homeopathic drops that calm pets down during thunderstorms, fireworks, etc. These drops take a half hour to start working, during which time the cats demonstrated how noisy the trip would have been had we not stopped at the vet and picked up the medication. 1. Mice and spiders are open season at all times in all locations. 2. Skinks, which they can identify by their shiny blue tails are never in season. 3. Birds may only be hunted in the wood behind the house and are limited to any birds I do not deem as 'cute'. The three bird feeders we just added at the front of the house are a bird sanctuary and no hunting is allowed there. In regards to #1 above, we are not particularly happy with mice right now. While we were gone, they found a large bag of rice. We discovered this when I went to put a large rug back onto the living room floor which I had finished painting right before we left. I picked up the rolled carpet and grains of rice fell out of it. I carefully unrolled the carpet and found several cups of rice had been moved into the rolled up carpet. We remembered we had taken the bag of rice out of a bucket it had been sitting in and placed it on the floor, we checked and sure enough, there was a hole in the corner of the bag. The mice must have been extremely busy relocating the rice, besides the large amount in the rug, we have also found a cup or so inside a shirt that was lying on a box in our bedroom closet (the rug was in the guest room) as well as another cup or so inside a package of toilet paper in the bathroom cupboard under the sink. My thought was that they kept hearing me refer to the house as the 'honeymoon hotel' for insects and they decided to add some ambiance by throwing rice everywhere. While I was expecting to come up with a list of things I missed from the old life once we were living it again, the only list we came up with were the things we were missing from the property while we were up North! Yes, we miss friends and family when we are down here, but so much of our contact has always been by phone, text and email, it really hasn't been too difficult when we don't see them face to face as often. Skype also helps, and I bribe my children to send pictures of the grandchildren to my phone. Instead of looking at each other while enjoying the on-grid-life amenities and saying "Boy, I really miss this", Alan and I would look at each other and say things like "Ahh, we would be pulling water at this time back home", or "I miss not bringing in wood every morning." So now I am pondering - Did we fail the test because we did not have anything on our list that we miss from our old life? Or did we pass with flying colors because we have embraced our choice to increase our self-reliance and simplify our lives? I admit that our Turkey Palooza has become quite a financial extravagance over the years, one that we are very grateful for and will continue to share with our children as the Lord provides. But one of the best feeling I had as we prepared to once again hop off the grid was the realization that we were looking more forward to going back to what most people would consider a much 'poorer' lifestyle than what we could be living, and yet it makes us much happier and it is the life we choose!